In some ways Phish 3D captured the essence of a Phish concert but it was still a mixed bag of pleasure and disappointment. For all the hype and excitement leading up to Phish 3D, the truth is, part of me loved it and part of me walked out of the theater wanting more from the band’s 2009 Festival 8 performance and the overall 3D experience. The pre-show atmosphere inside the sold out theater in Chicago was undeniably palpable. While we waited for the movie to start, I decided to gauge the buzz and ask Josh, a loyal Phish fan who I brought along with me to see Phish 3D, what he felt about seeing the movie. Josh told me that he had been to over 50 Phish concerts and was excited to experience the band in a new way. But like most Phish fans he wasn’t quite sure what to expect during Phish 3D. Here’s a live recording of our Pre-Phish 3D chat. And stay tune for our post-show chat following my review. Then just as Josh finished, the intro credits flashed on the screen and a roar of cheers rippled through the theater. Instantly, the communal vibe of Phish 3D was stronger than what I felt during Larger Than Life, AEG Live’s first 3D concert movie that was released back in December and featured Dave Matthews, Ben Harper and Gogol Bordello at Austin City Limit Festival. During the two hour and twenty minute Phish 3D all types of live concert elements from the three-day festival popped from the screen. Beach balls bounced and plumes of stage smoke floated in front of us making me want to reach out and grab the beach balls and brush away the smoke as if I really could. Through a series of spliced edits, the first set of songs included the extended funky and soulful jam-outs “AC/DC Bag” and “Tweezer.” Then during the peaking chorus of “Mike’s Song” real glow sticks were hurled from the back of the theater and rained down over the crowd. It was a clever twist to the same unexpected tricks used during old-school 3D movies where water or other things were flung into the crowd to make the 3D effects seem more real. I wasn’t able to confirm if the glowstick trick was the decision of a few crafty Phish fans sitting in the back row, or if it was the official plan of AEG Live and Phish themselves. Either way, the glow stick wars that broke out in the theater added an excellent sense of excitement and beautifully merged our theater crowd with Festival 8’s flock of 40,000 fans. On the downside, most of Phish’s performances didn’t have a consistent flow of energy and the sets lagged at times. Only during the full-length daytime acoustic set and the Rolling Stones covers in the second set did Phish truly find their groove. From a production standpoint the sound was subpar and the picture quality was surprisingly inconsistent. Sometimes the HD shots were crystal clear and other times they were blurry and out of focus making it almost irritating and jarringly unpleasant to watch. Maybe it was a local theater issue because there weren’t problems like this during Larger Than Life, which had excellent sound and dynamic HD visuals from beginning to end. I do hope it was a local theater issue that can be fixed before the nationwide release on April 30th because these changes need to be made if Phish 3D is going to be worth fan’s time and money. When the visuals worked correctly experiencing Phish in 3D was really something special. The multiple vantage points provided a rare perspective of the band in full throttle. From various points of view you could see every inch of emotional expression on their faces including the tiny nuances of each band member’s sacred playing space and instrument. And when front man Trey Anastasio and keyboard sage Page McConnell flashed smiles and closed their eyes and drifted deep into their musical happy place, it gave the songs a depth you wouldn’t feel by just seeing them live in concert. Some fans took to the aisles and started dancing and twirling, too. And during the customary call-and-response mythological storytelling song “Wilson,” even fans in the theater shouted back “Wiiiilllsson..” as if they were really in the Festival 8 crowd. Other than a brief intermission trip through the festival grounds, a quick fan montage and a short peek into a practice session, there wasn’t any revealing storyline or backstage band interactions mixed in to make Phish 3D unique. And sadly, you didn’t get to see anything that fans at the Festival 8 didn’t already see. As 2010 rolls on AEG Live will release more 3D concert movies from other artists. And after seeing two 3D concert movies this year my optimism is starting to erode. More and more I’m realizing that the real motivation behind making these 3D concert movies isn’t to push boundaries or make concert movies the way D. A. Pennebaker did with Monterey Pop Festival or Don’t Look Back. Nonetheless I’m an eternal optimist, and I’ll give AEG Live and company the benefit of the doubt and continue to hope that they will refine their craft of making 3D concert movies and not just churn them out to make money. I hope they do find some way to use 3D technology to tell concert stories that truly inspire, challenge, and redefine the concert experience. When the movie was over Josh and I dodged cars in the parking garage while we talked about our reactions. And here’s what Josh had to say as he compared Phish 3D to his other live Phish experiences. Did you see the April 20th pre-screening? What did you think of Phish 3D? Did you experience the same audio and visual problems like we did? Do you plan on seeing it on April 30th? What are your expectations. 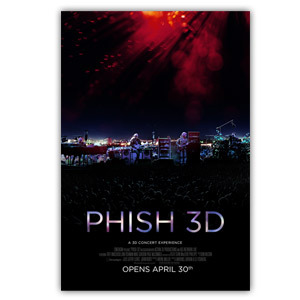 UPDATE: We’re having a PHISH 3D ticket giveaway today 5/4. Go here to enter to win. Here’s a Phish 3D set list courtesy of Concert Confessions. and Phans brought the glow sticks. that was a no-brainer.